Do you all love iced coffee? I do! Cold brew iced coffee is my go-to indulgence on a hot summer day. Buying iced coffee from a coffeehouse can add up quickly! 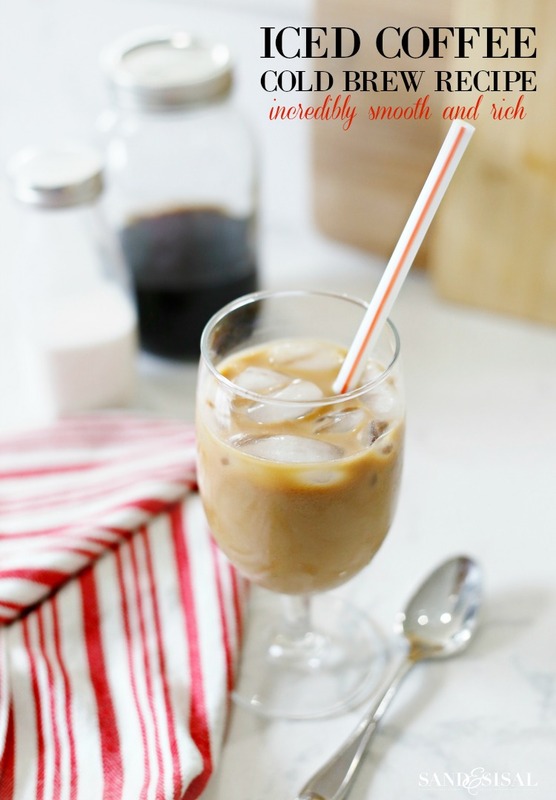 If you want to save some money and make your own at home then you will love this smooth and rich cold brew iced coffee recipe! Wait! You might be asking what is the difference between iced coffee and cold brew iced coffee? Technically iced coffee is simply strong, hot brewed coffee poured over ice. The hot brewed iced coffee will smell wonderful but will lose its flavor rather quickly. The ice melts and dilutes the coffee giving it a watery taste and can be more bitter. Cold brew iced coffee is the method of brewing coffee using cold water and allowing it to brew slowly for 12-24 hours. The cold brew method results in a coffee that has an incredibly silky smooth and rich flavor. The cold brew coffee is poured over ice and then milk, cream, or other flavorings can be added. It doesn’t have as strong of an aroma but the flavor is consistent and lasts longer. 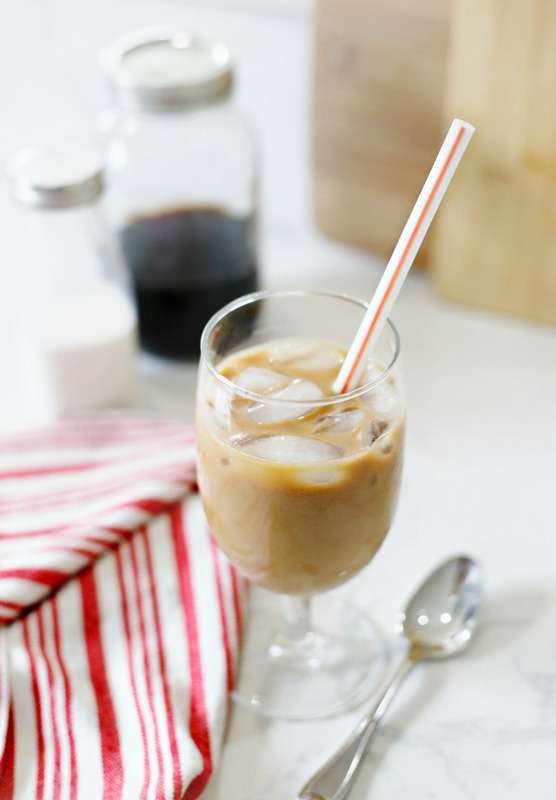 To make cold brew iced coffee you need to start with your favorite coffee! 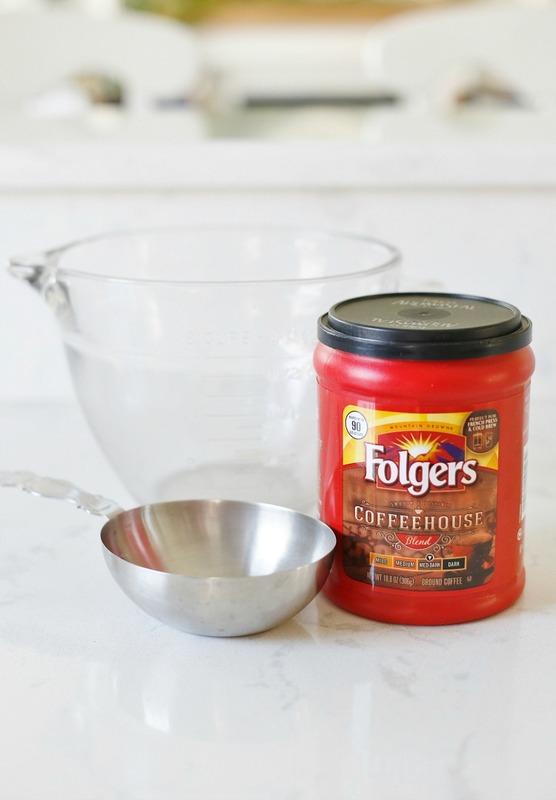 I’ve partnered with Folgers this past year and had the delicious opportunity to try and review every coffee blend they make and my personal favorite coffee is Folgers Coffeehouse blend. It has a bold and smooth with a distinct, delicious taste that really lends itself well for the cold brew method. 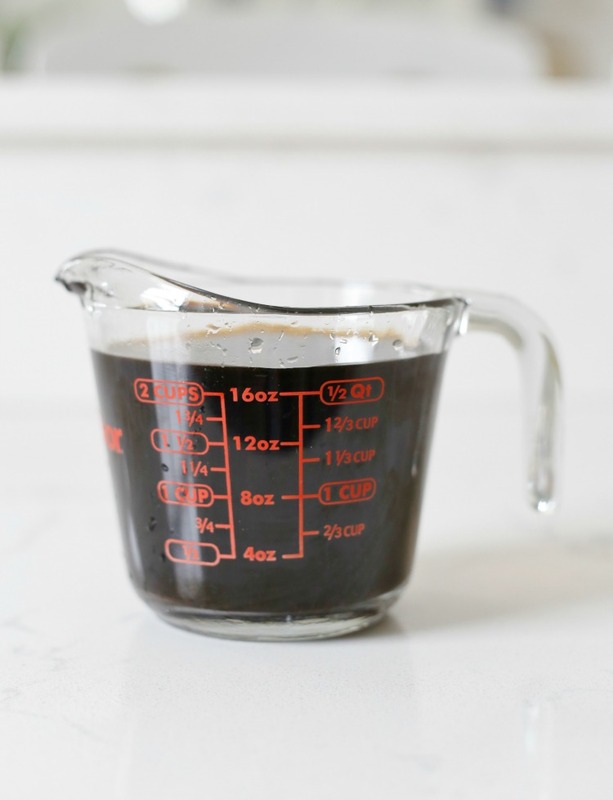 All you need to make cold brew iced coffee is a large bowl, cold water, measuring cups, ground coffee, a mesh strainer, coffee filters, and a little bit of patience… (which I completely lack, but this is totally worth it)! Step 1: Cold brew iced coffee usually starts with a 1:3 ratio of one part coffee to 3 parts water. When I make it, I think about how much I will consume in one week. So my recommended measurement is 1 cup of coffee and 3 cups of water. 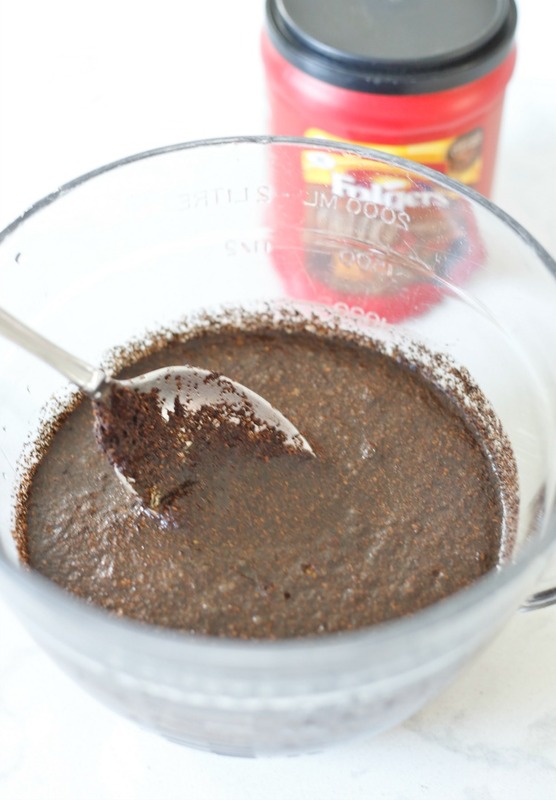 Put the 1 cup of ground coffee into a large glass bowl and pour in 3 cups of cold, filtered water. Step 2: Cold water and coffee grounds don’t like to mix easily. So be sure to take a spoon and stir the mixture until all the grounds are thoroughly wet. Cover with plastic wrap and allow to sit on the counter at room temperature for 12-24 hours. This is the step where patience comes into play. I prefer 24 hours for a stronger taste. Step 3: After patiently waiting 24 hours set a wire mesh strainer with a paper coffee filter placed inside. Place it over a large measuring cup or bowl and slowly pour the coffee into the strainer. And when I say slow, I mean SLOW! 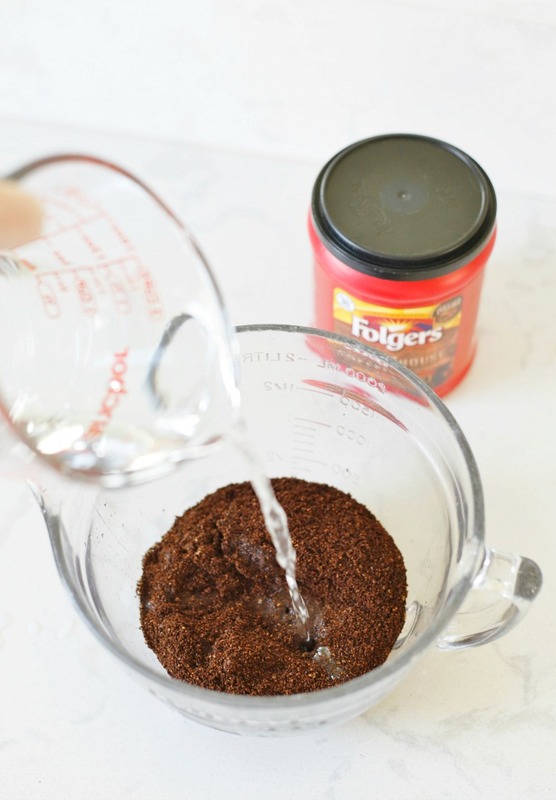 Use a spoon to move the coffee grounds aside if the strainer stops allowing coffee to flow through. You might need to use an addional coffee filter or two. Discard the coffee grounds in the trash (DO NOT PUT THEM IN THE GARBAGE DISPOSAL!). Straining will produce approximately 2-1/4 cups of delicious robust cold brew coffee concentrate! Step 4: Fill a glass 2/3 full of ice. 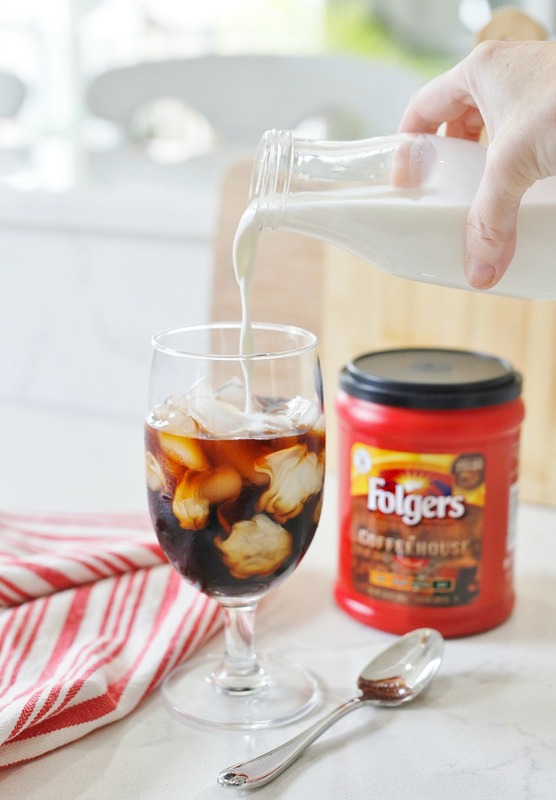 Pour the cold brew coffee over ice and add a generous splash of half-n-half, milk, soy milk, almond milk, flavorings, sweeteners or whatever suits your fancy. Stir and enjoy! Place 1 cup of ground coffee in a large glass bowl. Stir in 3 cups of very cold water making sure every ground is wet. 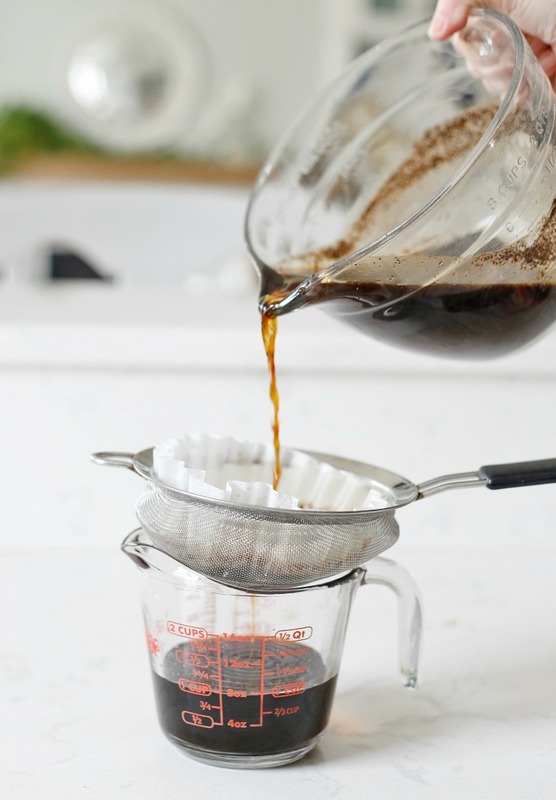 Place a paper coffee filter inside a small, wire mesh strainer and set on top of a 2 cup measuring glass or bowl. Pour the brewed cold coffee SLOWLY through the coffee filter, pushing grounds aside as needed. Change coffee filters if needed. This produces approximately 2-1/4 cups of cold brew concentrate. To Serve: Fill a glass ⅔ full of ice. Pour cold brew over the ice and top off with half and half, sweetener, or any flavoring you desire. Store cold brew concentrate in a sealed jar or container in the fridge for up to 2 weeks. So tell me! How do you like your iced coffee? Do you think you might give this recipe a try? 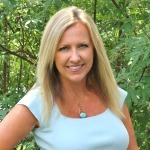 Hi Kim! I love the cold-brewed coffee, too. As a matter of fact, I just made some this past weekend! I use pretty much the same ratio of coffee/water, and I even have the exact same glass 8-cup mixing bowl/pitcher! LoL Great tutorial, I encourage everyone to try this if you love any kind of iced coffee. =) So easy! Ha! That’s great! It is so easy and taste so good. It’s saves so much money too! Thanks for stopping by and taking the time to comment Michelle! Love cold brewed coffee! This is a great recipe. Thanks for sharing! Thanks Kim! I hope you enjoy it! Have a great week! Thanks for this recipe. Was just looking at cold brew coffee makers the other day. Will definitely have to give it a try! Wow, so easy process! I love the cold-brewed coffee. As a matter of fact, I just made some this past weekend! I use pretty much the same ratio of coffee. Very good tutorial, I encourage everyone to try this if you love any kind of iced coffee. Thanks! It’s sooooo so good! I just love this. It’s so easy to make & delicious also. Love this idea. Thanks a lot for sharing.